I will admit that this dress was a bit of a project. I attempted the transformation for a couple of reasons. Firstly, I loooved the fabric! Yellow plaid flannel?! Whoa! Secondly, and very importantly, the dress was basically free. I found it while sifting through clothes at a stuff-a-bag-for-$5 rummage sale. Couldn’t go wrong, right? At least the first step to dress improvement was simple. Remove those shoulder pads! Since the dress came from a rummage sale, I wasn’t able to try it on until I got home. Upon try-on, I discovered that the cinched waist was a bit too tight and actually hit me below the waist at a poochy place. Uncomfortable! I found that the waist cinch was created by a band of elastic encased in a tube of fabric. Using a thread ripper, I open the tube so that I could removed the elastic. Once the elastic had been cut out, I had to re-sew the tube closed so that the waist wouldn’t hang strangely. In the picture, the tube to the left of my finger is still open. To the right of my finger, however, the tube has been re-stitched closed. The next step was to trim down those huge sleeves! I realized that the shoulder seam was actually long enough to become a cap sleeve for me. I marked 2 inches from this seam to create a seam allowance. I cut along my marks to remove the sleeves. I tried on the dress and realized that the waist was still lower than my waist. In an attempt to fix that, I raised the shoulder seams. I used a ruler and disappearing pen to mark where the new seams should be. After pinning, I stitched along the line I had drawn. I laid the dress out flat, removing the wrinkles as much as possible. I then pinned the front and back of the bodice together so that they wouldn’t move, and then I folded the dress in half. I placed an existing dress on top to use as a pattern. 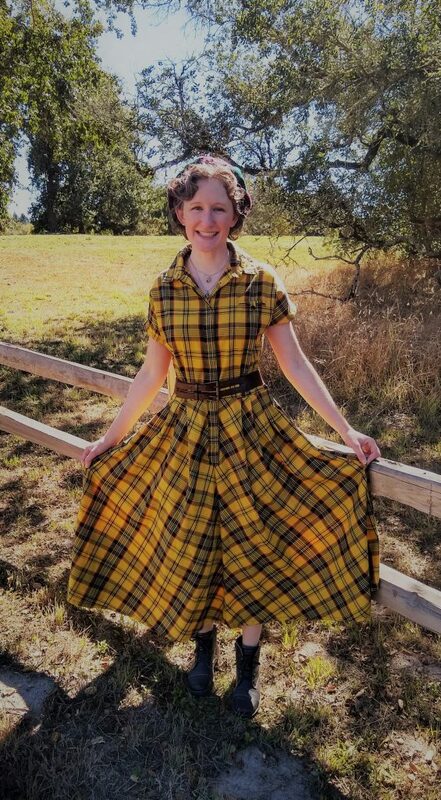 The pattern dress had a similar style and was of a similarly non-stretchy fabric as the flannel dress. 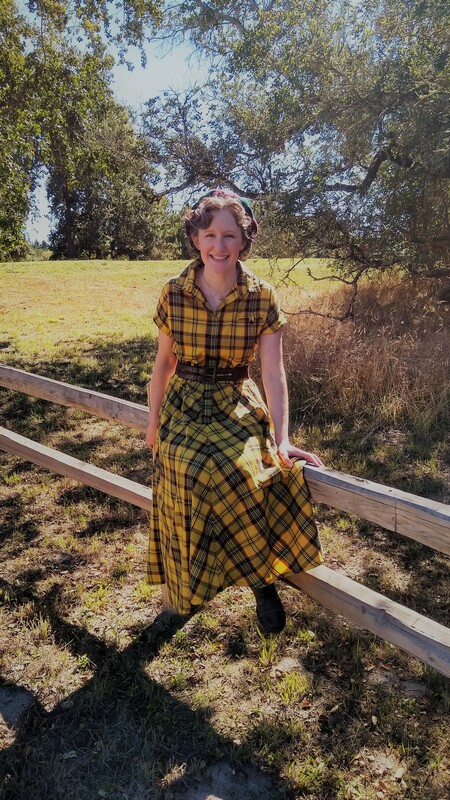 It was also important that the pattern dress have a somewhat roomy fit, since I did NOT want to cut the flannel dress too small! As a added precaution, I traced about an inch and a half extra around the pattern dress. I then cut according to my marks. I pinned the side seams and stitched them closed, leaving the sleeve area open. (I will want to fiddle with those sleeves later.) Ta-da! The dress is getting whittled down to size! After trying on the dress again to test the alterations, I moved on to hemming the sleeves. I rolled the hems, pinned them in place, and stitched. I also extended the side seams up into the hemmed sleeves. 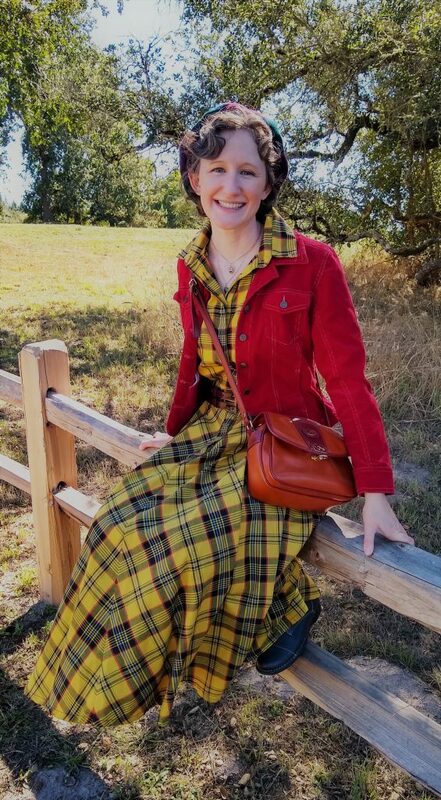 I decided to try the dress with some fall layering! A wide belt helped adjust the waist, while lace-up boots and a plaid beret added highland flare. 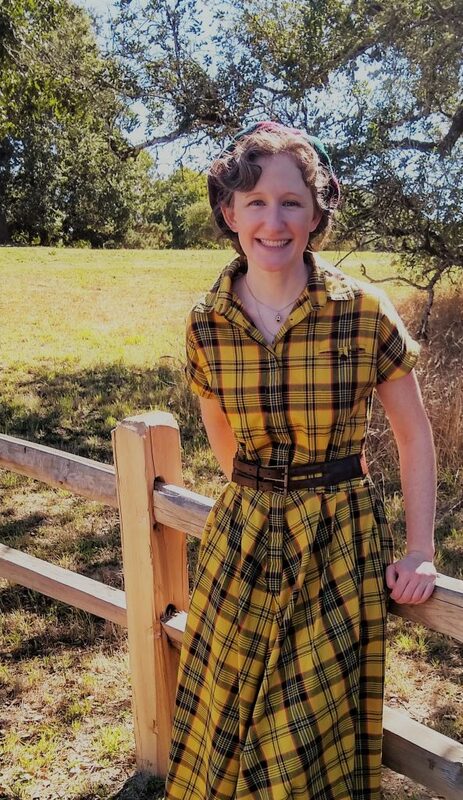 The dress turned out to be super comfy and somewhat warm, due to all that fabulous flannel! 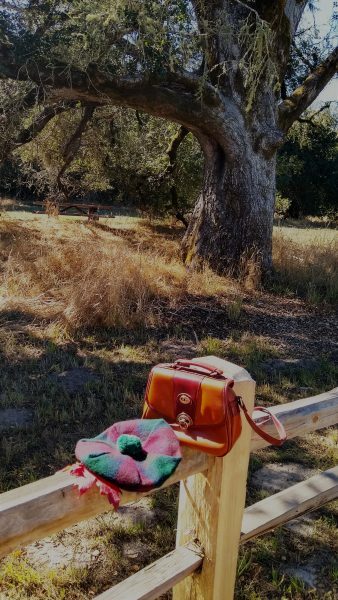 I played with the color skeme a bit by adding a thrifted corduroy jacket and vintage purse. I love how both pieces coordinated with my beret, which came courtesy of Scotland!